⬅ Advice to young leaders. Listen: The most important skill you can develop is the ability to listen. So often Christians, especially preachers, think that their only service is always to have to “offer” something when they are together with other people. They forget that listening can be a greater service than speaking. Learn to listen: One of the most difficult lesson to learn as a young leader is knowing when to speak and when to be quite. Listening is a skill that must be learned if you are to be effective as a leader and if you are to reflect the heart of God. It’s so easy to fall into the trap of giving people answers to their problems or what we perceive their problems to be. Sometimes the best thing you can do is to say that you are sorry and that you will pray for them or to say that you don’t have the answer but you know someone who does. Pat answers can produce a shallow simple faith that when tested will always bend and will often break. Many people seek a sympathetic ear and do not find it among Christians, because these Christians are talking even when they should be listening. But Christians who can no longer listen to one another will soon no longer be listening to God either; they will always be talking even in the presence of God. The death of the spiritual life starts here, and in the end there is nothing left but empty spiritual chatter and clerical condescension which chokes on pious words. Listening demonstrates dependence: Our ability to listen to the voice of God comes from our ability to listen to others. Our ability to listen to the voice of God comes from our ability to listen to others. The more we feel that we know what we are doing the less we seek divine guidance. The more we talk the less we learn. The more we listen the more we grow. There is also a kind of listening with half an ear that presumes already to know what the other person has to say. This impatient, inattentive listening really despises the other Christian and finally is only waiting to get a chance to speak and thus to get rid of the other. This sort of listening is no fulfillment of our task. And it is certain that here, too, in our attitude toward other Christians we simply see reflected our own relationship to God. 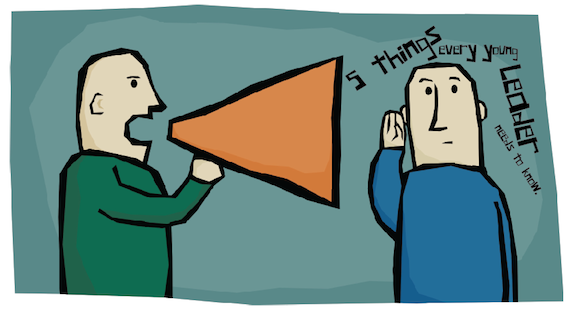 Listening reveals what we trust: People that are listening out of obligation drive me crazy. If you are not listening with an attitude to learn but are thinking about what you are going to say next DRIVE ME MAD (yes I used all caps). Pretending to listen is the one thing that is worse than not listening at all. Pretending to listen is the one thing that is worse than not listening at all. I have done this and have had it done to me. Don’t do it, young leader. In your excitement to share your outside the box idea, do not fake listen and posture your next point. Truly listen with patience and humility God showed us in Christ Jesus. Who came not to be service but to serve and give his life as a ransom for many. Christians have forgotten that the ministry of listening has been entrusted to them by the one who is indeed the great listener and in whose work they are to participate. We should listen with the ears of God, so that we can speak the Word of God. Our ministry of listening is vital to our spiritual health and it’s vital to our long-term success in loving people. 6 Principles of good listening. 4. Repeat back what you feel you have heard so that you know that you have heard right. 6. Be fully present. Do not check your phone. Great reminder even for those of us NOT so young in ministry! Thanks for the encouragement. So this is all obvious info…and most of us know that this is important. But the reminder is SOOOOO helpful. We are able to think back over the last day, week, or month, and be convicted and make a plan to become better listeners. Thank you.